It's not often on this blog that I have a genuine "scoop" (in fact, it's never happened before), but I believe I'm the first person to have put together castings from the new line of releases from King's Mountain Miniatures. 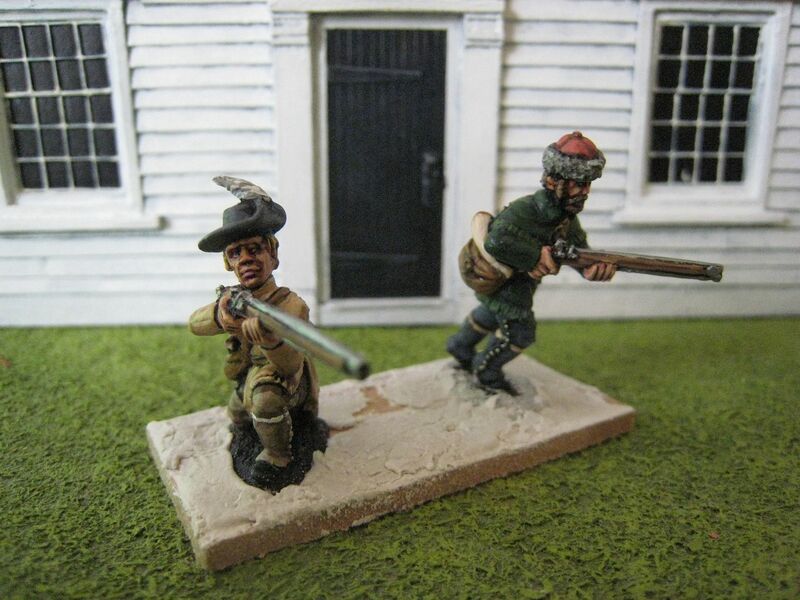 For those who either missed my posts on the KMM highlanders or haven't come across KMM before, this is the brainchild of American wargamer/collector Bill Nevins who has commissioned Alan Marsh to sculpt AWI figures that Bill is particularly partial too. The first stage was the release of a large number of highlanders which significantly increase the options available for later war highland regiments. Bill has now produced a truly staggering release in two parts: first, a 16-figure release of "over mountain men"("OMM") figures (well, in fact, torsos) and secondly some 240 different heads either for use with the OMM figures or to do head swaps on any other 28mm figures. 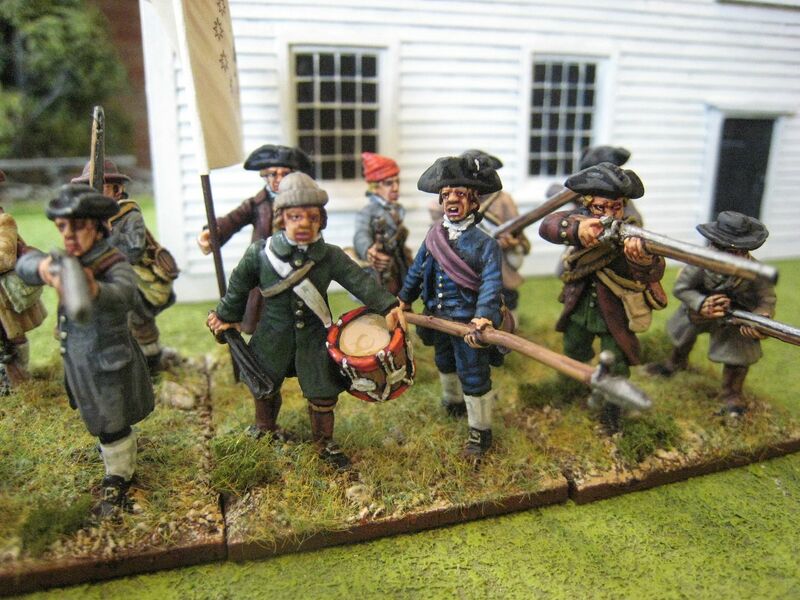 In fact, the separate heads break down quite clearly into OMM-suitable heads and Continental Army heads. The "staggering" part of this release to my mind is the fact that the 240 heads between them given you pretty much every type of hat, cap, bonnet, helmet and head-gear that you'd need for any American soldier in the AWI. There are also bare-headed and wounded heads. The torsos are a mix of charging and firing line poses, with one officer (above photo, far right) and a pointing NCO in a uniform coat. Here are photos of some assembled figures. As I've said, all the OMM sculpts are headless so you have a wide variety of heads to choose from. The heads have little plugs which slot into a hole in the torsos, although I've found that the heads sit best when you cut away most of the plug (otherwise the necks can look too long). 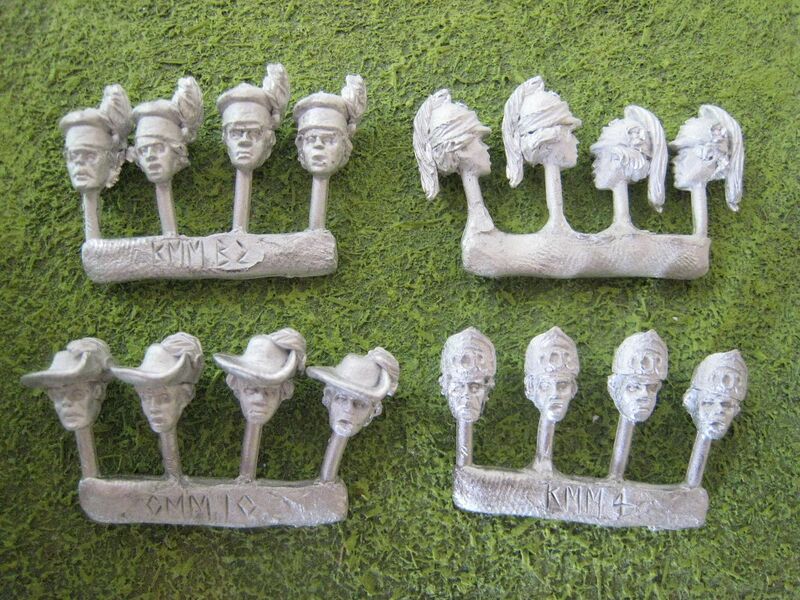 I haven't worked out how many different variants you can create, but as each type of head-gear has 4 different heads, and in most cases the OMM specific heads come in both shaved and bearded versions, I'm guessing that you can create over a hundred figures and not have two exactly the same. That's just the OMM themselves. 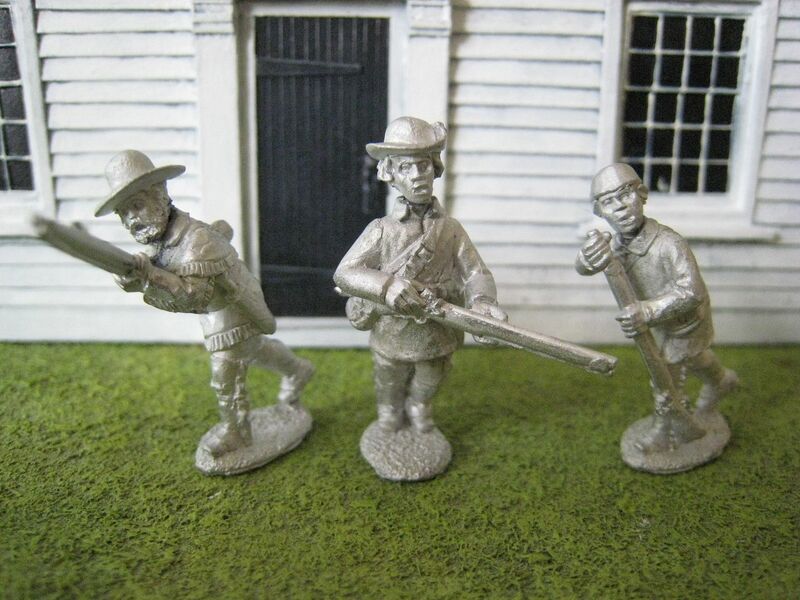 The separate heads obviously provide enormous conversion potential for other American infantry. With these heads and, where appropriate, basic American bodies in uniform coats rather than hunting shirts you can create Philadelphia Associators, light infantry, South Carolina and Massachusetts infantry, Washington's Guard, the foot elements of Pulaski's Legion and Lee's Legion and many others. 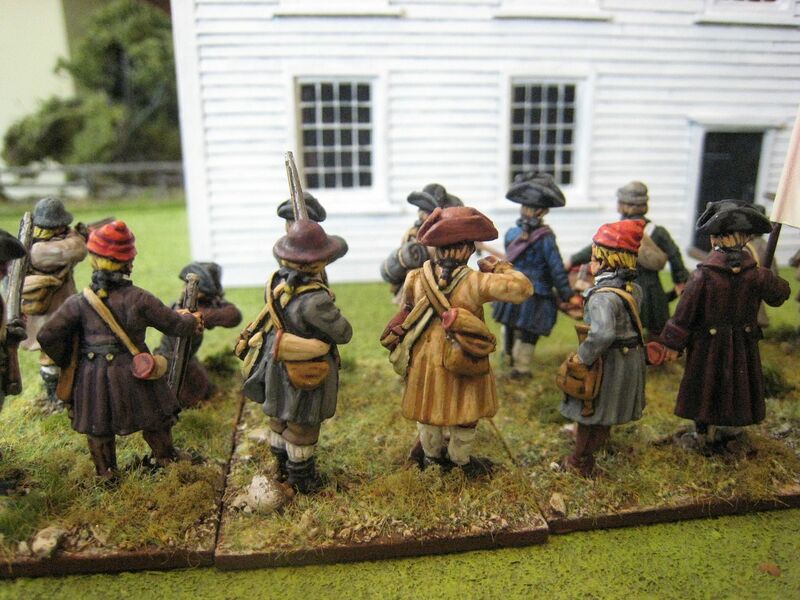 And it's not just Americans - there are the right caps to do Roger's Rangers too, using the OMM bodies. So there's lots of potential here. I've yet to fully explore all the options, but initial thoughts for my own collection are to do the 6th Virginia Regiment (in grey faced red smocks/hunting shirts and round hats - see the middle figure in the photo on left and the figure on the far left in the first photo above), Virginia militia in hunting shirts and hats, the OMM themselves. Other units will need to utilise existing figures from other companies. 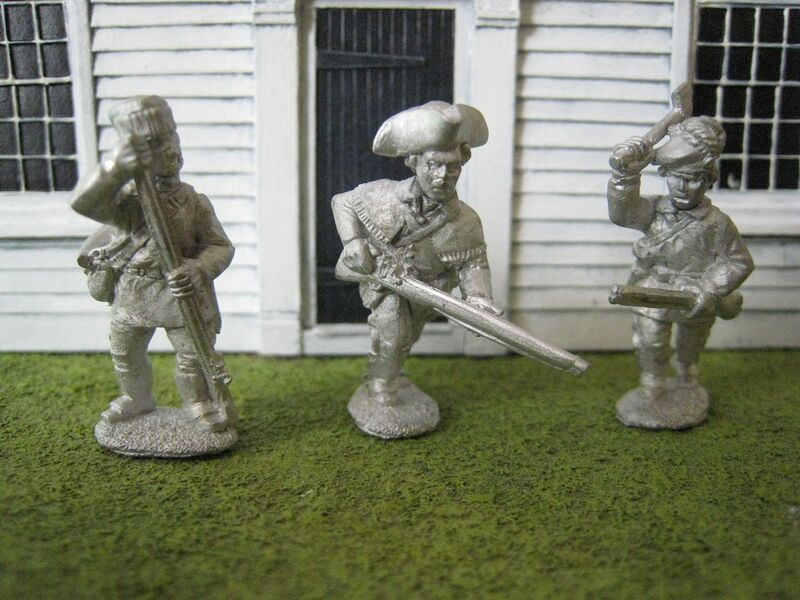 An obvious candidate would be the forthcoming Perry plastic Continental infantry. 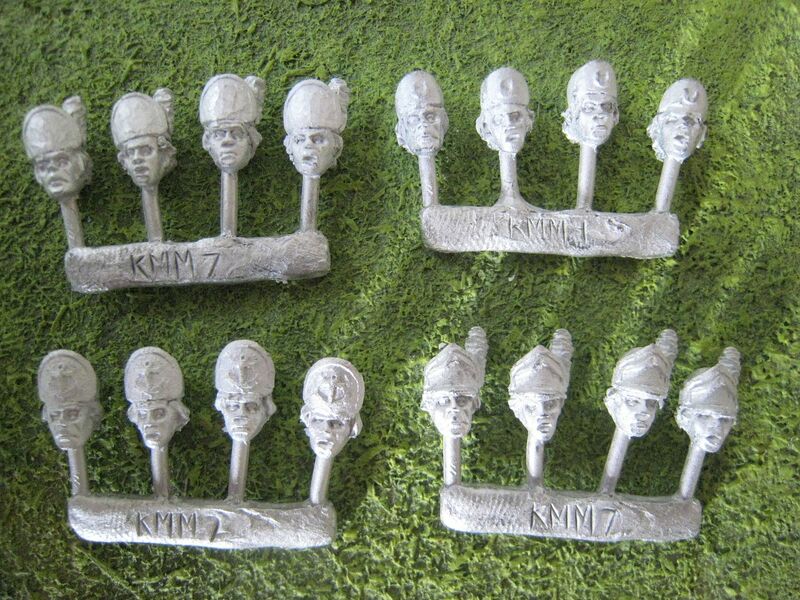 I haven't yet tried adding one of the heads to a Perry plastic British infantryman, but I'll do that to see how they look - I suspect the heads may look a bit large. Of course it that proves to be the case the answer is simple - Bill will need to commission a couple of torsos of Continental infantry...! 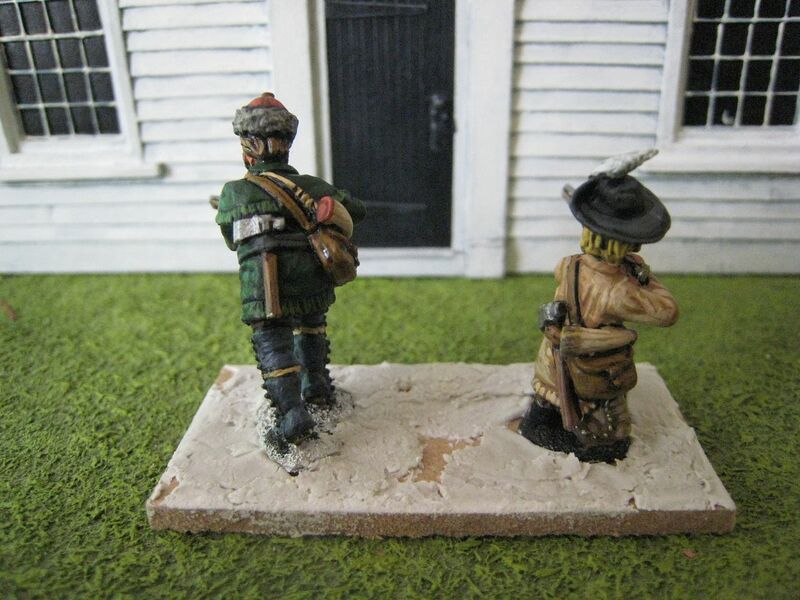 Below are photos of 2 figures I painted in a bit of rush yesterday. The bodies and heads were chosen pretty much at random. 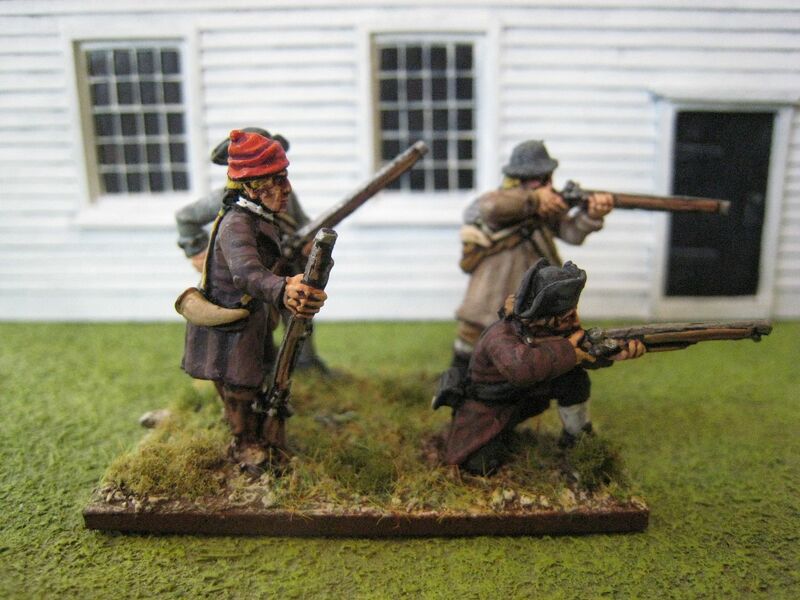 I've started basing them as skirmishers - some OMM riflemen fought on the flanks at Guilford Courthouse, presumably in skirmish or loose order; so these figures have that engagement in mind. Some of the "Continental" heads. 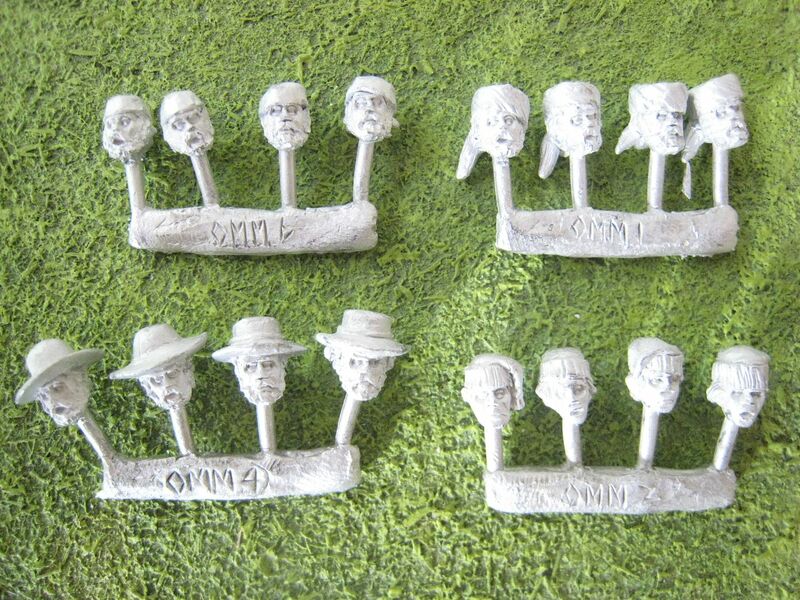 And some of the "OMM" heads. The head-gear on the top right looks like some sort of turban; I've never seen it before. I've not entirely sure when all these figures will be available. 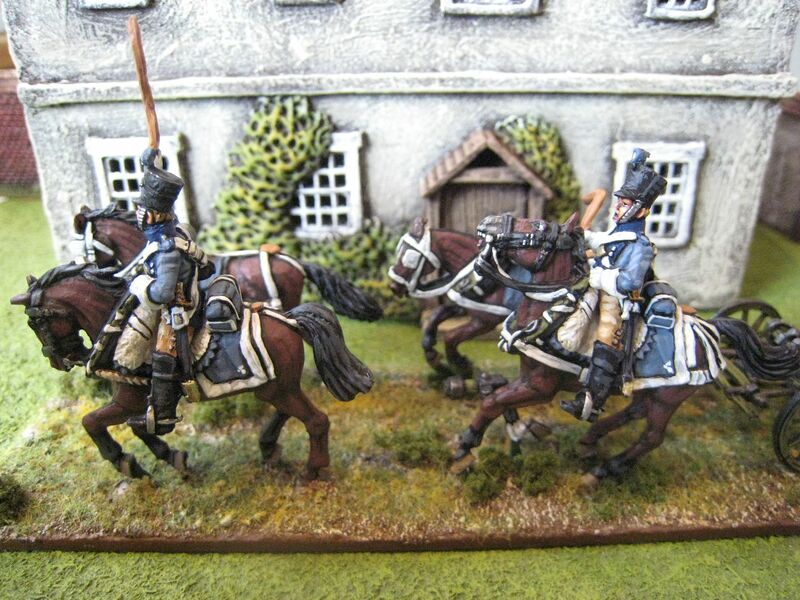 In the UK, KMM figures are generally available from Galloping Major. 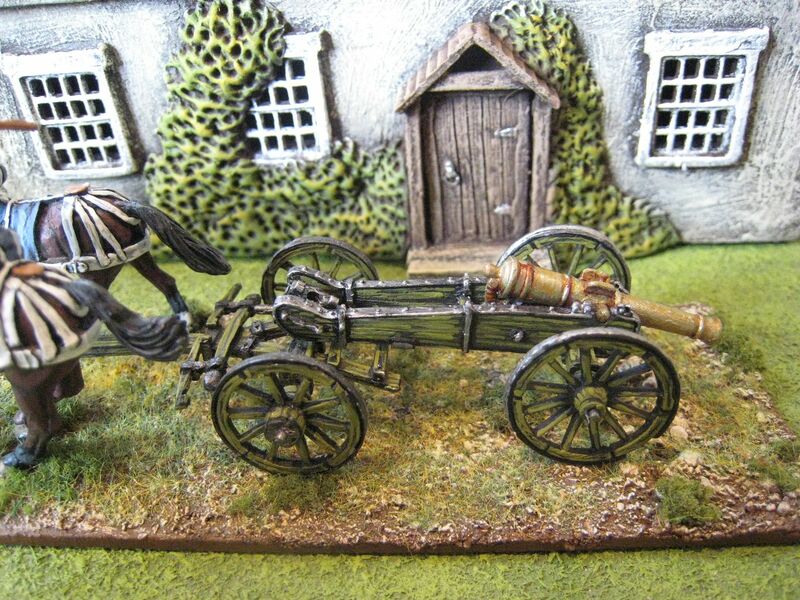 This is the Perry Miniatures model of a French line artillery 4-horse limber with a 6-pounder gun. 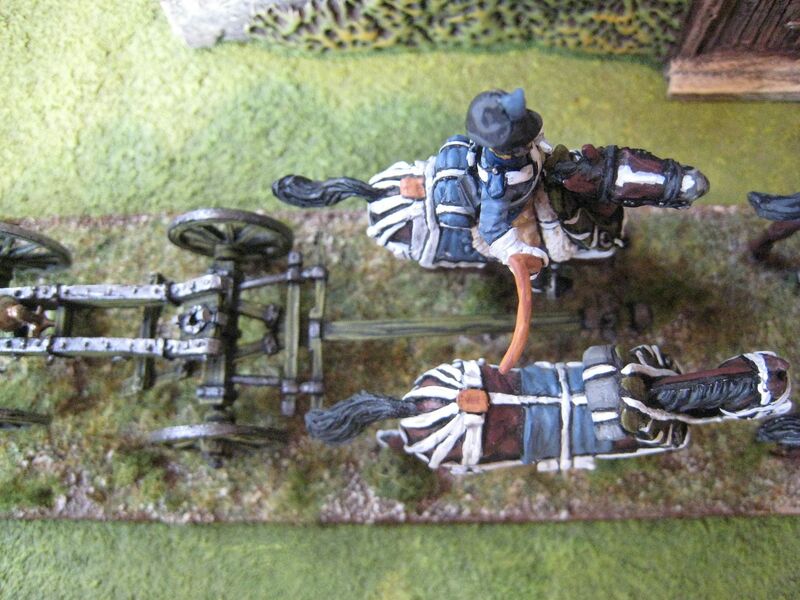 I painted most of this at the beginning of the year, but then rather lost interest in it as I couldn't work out how the limber was supposed to be attached to the horses. It then occurred to me, after scrutinising photos on the interest that you're not supposed to attach it to the horses without building your own traces etc. I posted a query on TMP and received some very helpful replies, but which also confirmed my initial thoughts that there's nothing you're supposed to do with the set if you don't want to. That said, Sada did an amazing job adding traces and ropes, so the effort pays dividends if you put your mind to it. I decided that in the end I couldn't really be bothered to spend more time on this set and knew that I'd only make a total hash of it if I tried to add fuse wire or whatever to fill in the traces. So what you have here is the unaltered Perry set. I'm not sure it really works without anything being connected to the horses (see photo on left), but I imagine it's completely impractical to sculpt and mould anything else. Another minor grips I have is the "advancing rapidly" pose of the set. I suppose in games you do need moving limbers to show guns that are, er, moving. But personally I prefer standing limbers which I can place behind the firing/loading gun models. 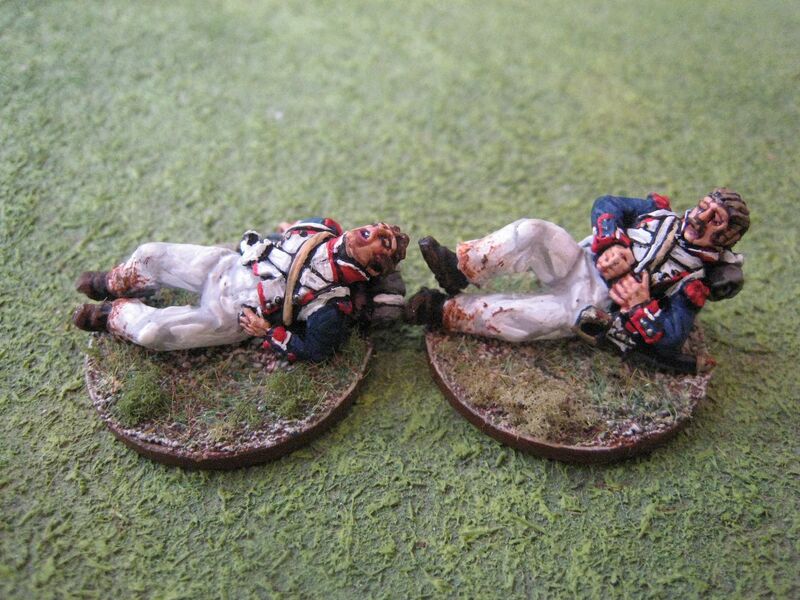 Then again, I'm not much practised in Napoleonic games and maybe in 25mm there's just no space; in which case moving limbers are probably best. 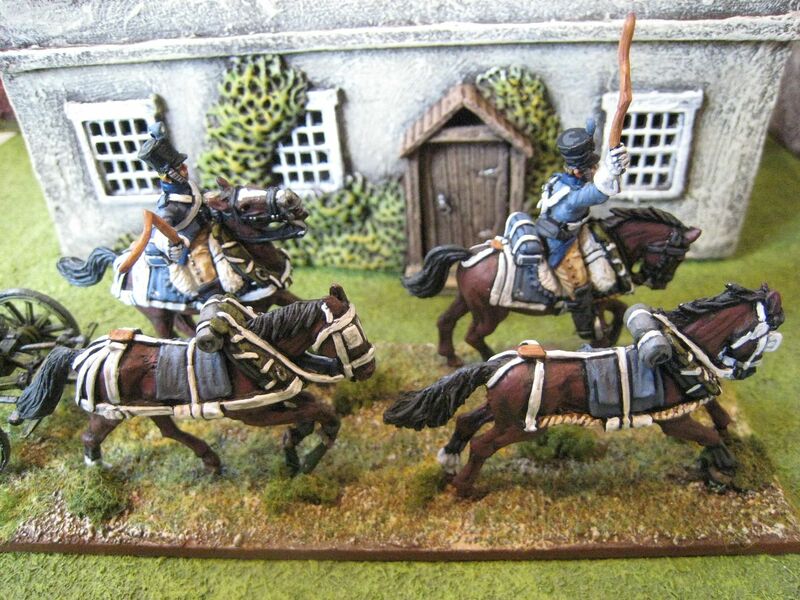 I thought it would look nice to paint the horse team in the same colours, so they are bays painted with the Foundry "Bay Brown" palette. The colours used for the drivers' tunics were Foundry palette "Confederate Grey 117", while the limber and gun were painted with my usual French Napoleonic artillery green combination: base coat of Vallejo "Yellow Green" mixed with plain black, then first highlight of "Yellow Green" and second highlight of "Yellow Green" mixed equally with Vallejo "Dark Yellow". 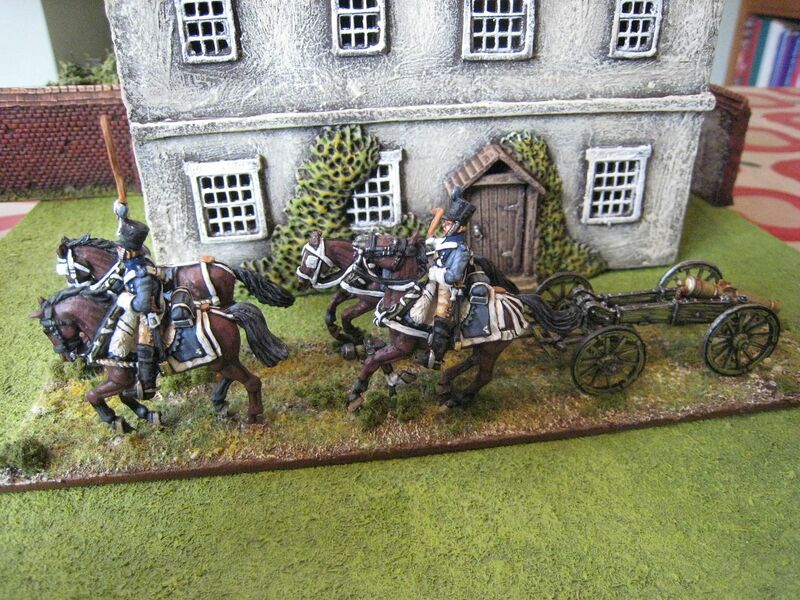 The whips rather failed me, I'm afraid - I had no idea how to paint them and recall not finding much help via Google. 2 drivers, 4 horses and a limber. Painted January 2013. This is the first proper AWI unit I've finished since my first go at the Perry plastic British infantry. I bought a couple of packs of the new-ish Perry "northern militia" packs at Salute and decided to have a crack at them a few weeks ago. Once again, I needed a bit of a break from painting red-coated highlanders. 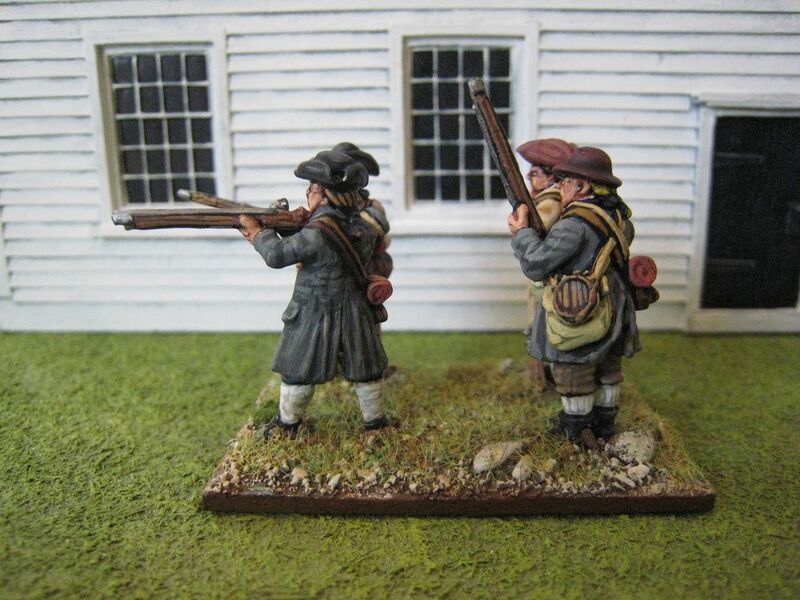 This unit mixes figures from those Perry packs as well as some of the figrues in the older Foundry "minutemen skirmishing" pack that Alan Perry made years ago. 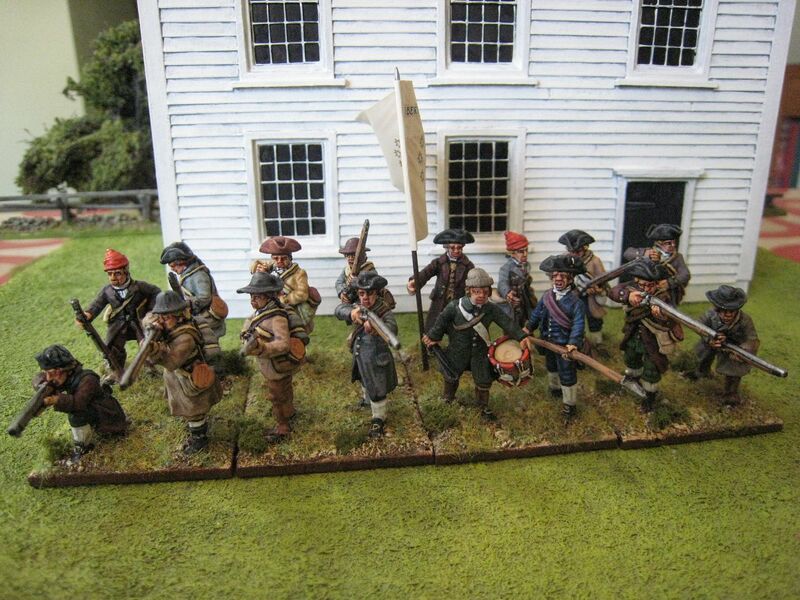 The Perries have now released figures described as "southern" and "northern" militia (and some very useful marching negroes). This distinction is largely shown by the former being in shirtsleeves and the latter in coats. There is some difference in headgear too, with some northern types wearing a sort of skull-cap that I gather was popular in the northern states and the southern types wearing a variety of broad brimmed hats to shield their faces from the sun. The northern guys are carrying rather more kit. As a general concept this north/south distinction clearly works. I've been to South Carolina and seen how hot it can get there and the shirtsleeve types are more suitable for summer campaigning in the South. But of course it gets hot in the northern states as well and it's worth remembering that two of the best known southern theatre battles, Cowpens and Guilford Courthouse, were fought on damp, cold days in January and March respectively (I've seen references to the temperature at Guilford as being around 45-50 degrees Fahrenheit or 7-10 degrees Celsius). 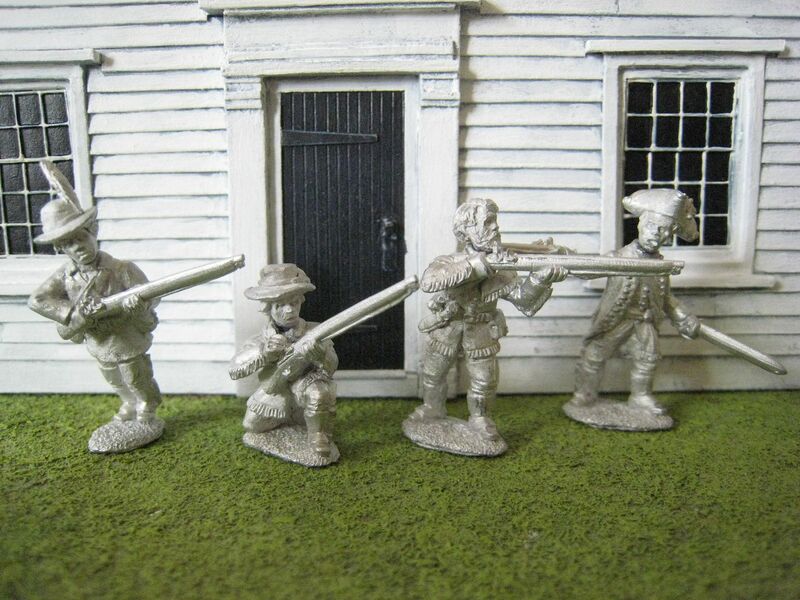 So another way at looking at these militia figures is to think of them as being suitable for "hot" days and "cold" days. 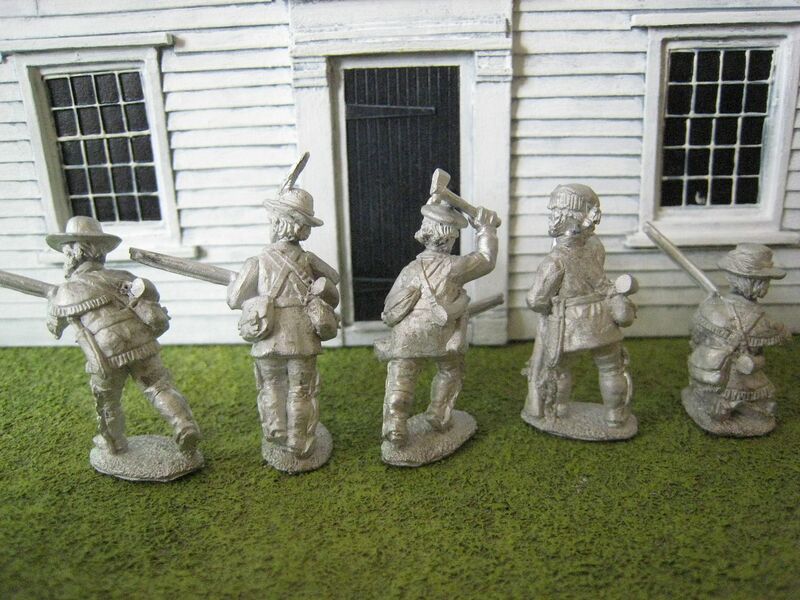 The Perry southern militia figures with bayonets are perfect for representing Continental infantry in battles in the north such as Monmouth, which was fought in June on such a hot day that troops on both sides collapsed from the heat and many Americans took off their uniform coats and fought in shirts and waistcoats. Bunker Hill was fought in mid-June and while I've experienced first hand how utterly freezing Boston can get even as late as April, I expect by June it's usually reasonably clement. 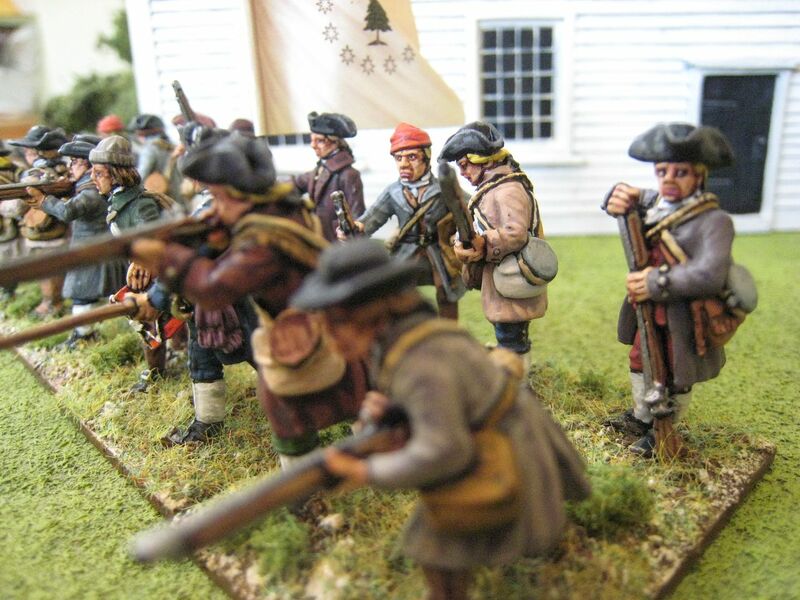 Don Troiani's excellent painting (see here) of the "whites of their eyes" moment certainly has men in coats and shirtleeves Of course, on the tabletop none of this really matters - militia are militia irrespective of what they're wearing - but the choice is there if you want it. This unit, the first of two militia "firing lines" that I've been working on, is designed for cold weather service. To build a 16-figure unit requires a bit of doubling-up on figures, but I think there are only 2 pairs of the same figure, such as the Foundry figure in the liberty cap - I stupidly painted both caps red, which makes the figures jump out a bit. Those caps aside, I deliberately used a more muted palette on these - lots of greys, browns, dark greens and tans on the coats, many from the Foundry WW2 and ACW paints. In most cases I painted the breeches and the waistcoats in the same colours, as wearing this kind of "suit" seems to have been popular (according to contemporary portraiture, which of course probably reflects the richer end of American society; but then again Don Troiani has militiamen dressed like this too). I painted the officer in the dark blue suit Troiani uses for a similar-looking chap in his Bunker Hill painting - I'm not entirely sure which of Stark, Warren or Putnam this person is supposed to be (if any of them - I'm assuming the other Perry officer figure is modelled on Troiani's William Prescott, the person in the long, grey coat). 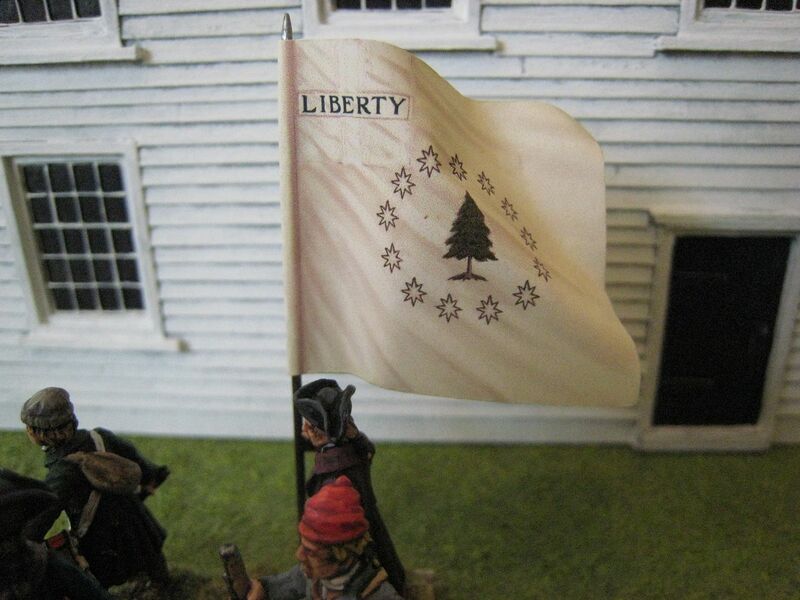 There's then the question of flags and whether militia carried them. 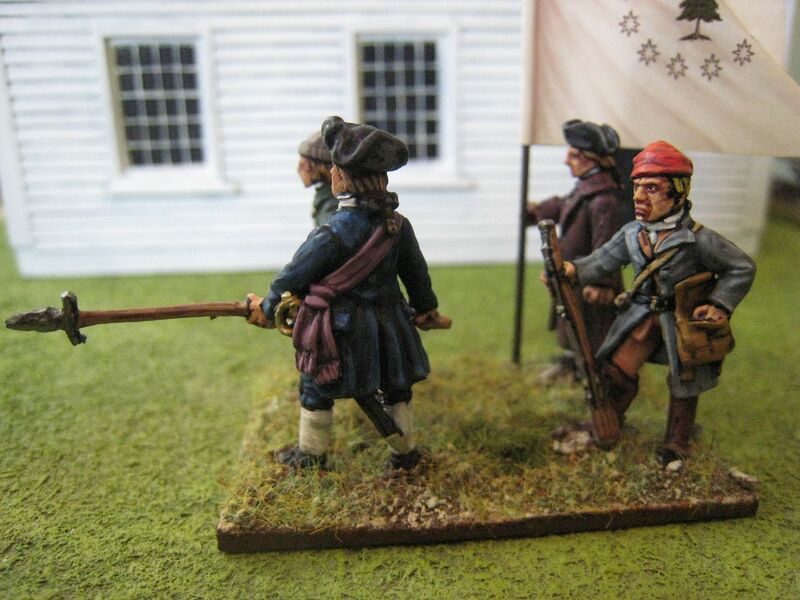 I've already used my "Bunker Hill" flags (on very early units that aren't anywhere on this blog) so selected one of what GMB call "ex King's". I understand that this type of flag would have been a pre-war militia or provincial flag with the union jack in the corner removed. I think it looks pretty nice. The photos aren't the best, I'm afraid. I find taking shots of firing line figures can be tricky to focus correctly. 16 figures. Painted August/September 2013. Flag from GMB. 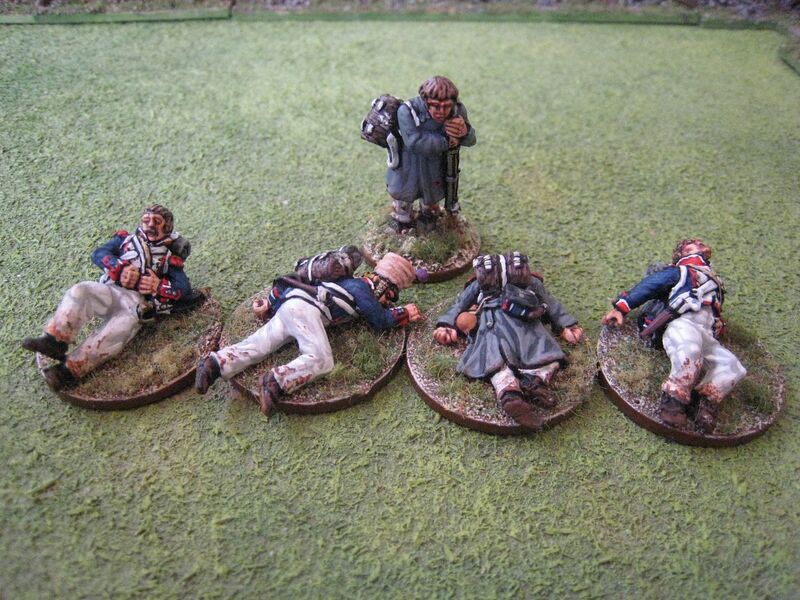 I have some larger units close to completion, but in the meantime here are some Perry French Napoleonic casualties I painted a few weeks ago. Not much to blog about, but I put the same effort into dead figures as I do into live ones so I thought I might as well post pics. 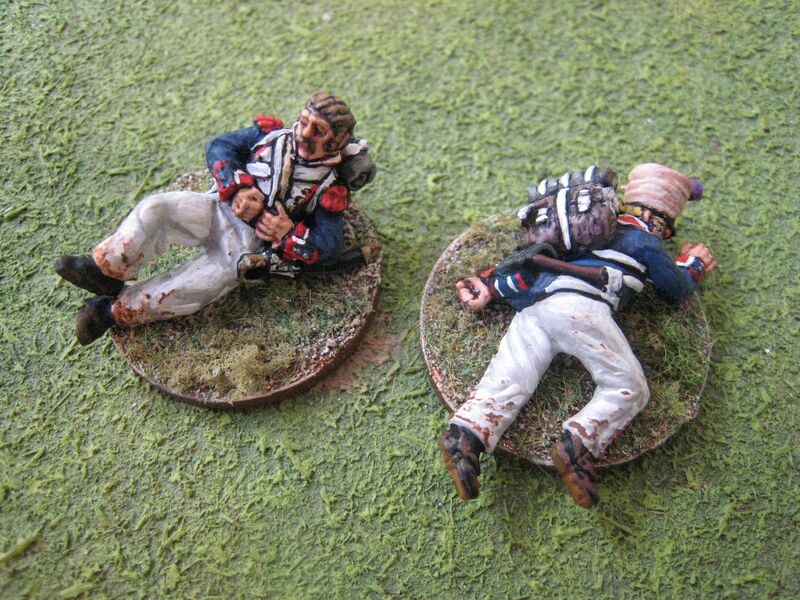 Most of the figures are from pack FN16 ("line infantry casualties"), which includes 2 marching casualties that I'll incorporate into my next line battalion. The chap in the tunic lying face down is a plastic figure from the French heavy cavalry plastic boxes - I think this plastic figure is a bit bigger than the metal ones, which is odd as I think the plastic infantry are a tad smaller than their metal counterparts. The greatcoated figure leaning on his musket is very useful as he can be used for others periods - the First Carlist War, for example. I've always based casualty figures. I know many gamers just leave them "loose", but I like to have everything on a base as I think it looks neater and of course you can then add other bits and bobs like muskets, hats etc (which come with the plastic British infantryman casualty that is also in the Perry cavalry sets). 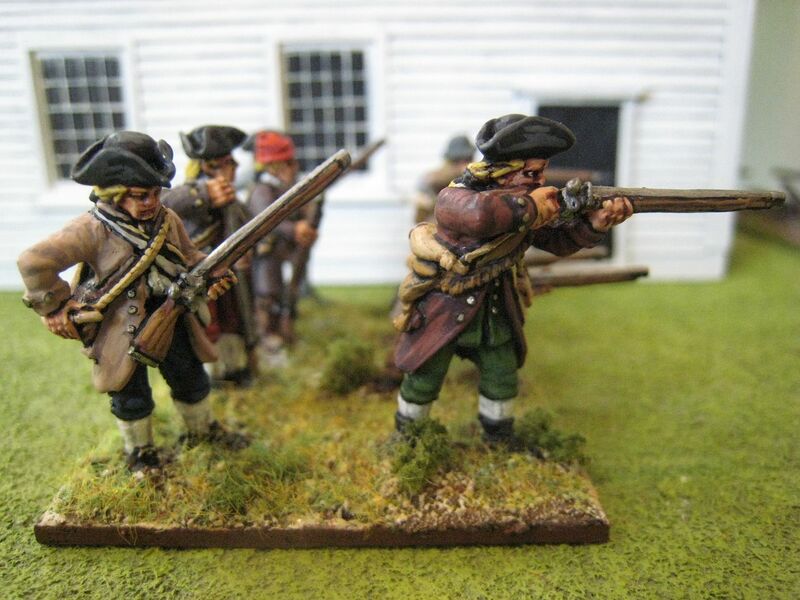 Front Rank sell packs of pistols, muskets, swords etc which are useful for adding to casualty bases. 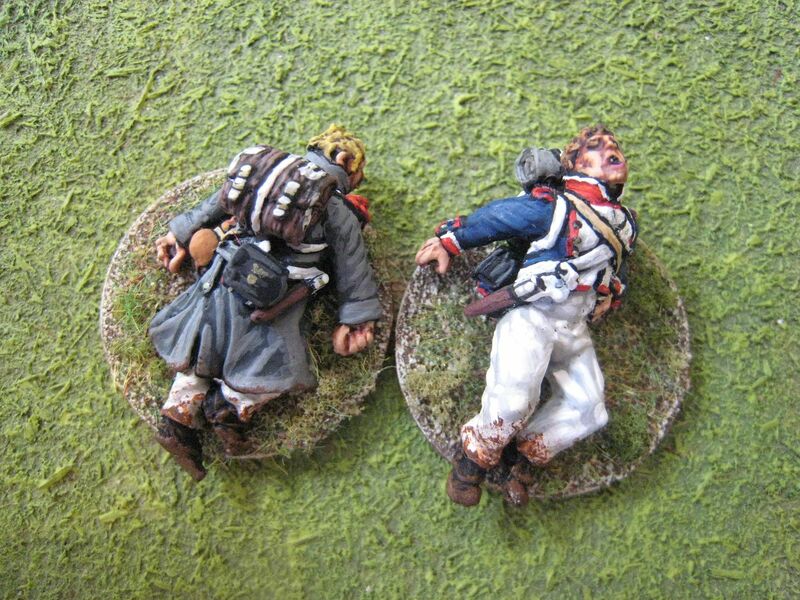 One thing I've noticed about Perry casualty packs is that they tend to have "character" figures in them - for example, the falling officer in FN16, the wounded man being carried by comrades in a couple of the AWI packs. These are lovely little pieces, but they do stand out rather and that means you're unlikely to buy more than one or (at most) two of each pack. For large Napoleonic battles, what a gamer really needs is just a pack of 6 different dead people. Five figures. Painted August 2013.